Attractions in St Ives are many and varied. Here are just a few to get you started. The beautiful clear water and stunning award winning beaches for those who wish to surf, swim, beachcomb or just laze and listen to the waves. The exquisite light which has encouraged artists to flock here for decades giving you the opportunity to enjoy the scenery, perhaps take up paints and easel yourself or visit the many acclaimed galleries. The harbour with the colourful fishing boats whose fishermen supply the local restaurants with fresh fish and shellfish. St Ives has a wealth of excellent restaurants leaving you spoilt for choice. The narrow cobbled streets where you seem to find something new and interesting around every corner. It is well worth wandering and just getting lost to see what you will find. 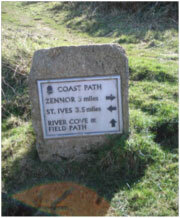 The coastal path will take you through some outstanding scenery. You can walk through the town to Porthminster Beach, up on to the coastal path to Carbis Bay or Lelant. Or walk down to Porthmeor Beach, directly in front of West by Five and follow the path up to Clodgy Point and continue on to Zennon. Keep an eye out for dolphins and seals as you walk the cliff paths as they are often seen in the bay. The famous Tate Gallery is just a few steps from West by Five; a stunning building overlooking Porthmeor Beach and is a must for anyone interested in British Modern Art. The gallery opened in 1993 and has since earned a reputation for celebrating British talent and offering a changing international exhibition programme. If this style of painting is not for you it is worth calling in at the café to enjoy a coffee and the spectacular view. The Barbara Hepworth Museum offers an opportunity to visit the house where this famous sculptress lived and worked. Many of her works can be seen both in the museum and around the town. A walk through Barnoon Cemetery is a must for history lovers as well as those who enjoy the scenic views across Porthmeor Beach. It is a great place for quiet contemplation after the bustle of St Ives town and enables you to view another face of this lovely town. The cemetery is the resting place of Alfred Wallis whose memorial is a work of art with the tiles created by the potter Bernard Leach. A great day out offering stunning gardens, beautiful sculptures and the world’s largest rainforest in captivity, complete with jungles and waterfalls. Cornwall’s famous open-air theatre offers a programme of events set against the backdrop of the open ocean. 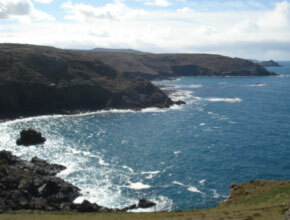 The most south-westerly point of the UK where you can experience the true wildness of the Cornish Coast.